We joined a small, legalistic, independent fundamentalist Baptist church (IFB) and went every time the door was open. (“We,” meaning the children and me; my husband did not attend.) I kept the nursery during church and taught Sunday school. It was one of those churches where if you missed a Wednesday prayer meeting you’d better be really sick or you got condemning looks and attitudes. I wasn’t fed much spiritually at church because I was busy earning love and approval watching children. But I was learning about the Bible at home. I had a deep desire to read the Bible and began buying devotionals and Christian books. Church attendance and Bible studies were duties. I tried to control our family with my lists of Christian rules, and I sincerely thought I was on the right path, but my artificial rules and regulations sucked the love of God out of our family. My husband was rejected by the church members. On one of the rare occasions when he came to church with us (twice), the second time he went forward for the altar call but was told he could not join the church until he proved himself. He was so embarrassed he never came back to church. After that he had several affairs, and finally abandoned us when I was pregnant with our fourth child. I filed for divorce a year later, and we didn’t see him for the next fifteen years. His children never had any relationship with their father except one daughter who got to know him a few years before he died in 2012. I was completely rejected by the church I had served for five years. I was told I had not been submissive enough to my husband. It was a small church and I think they were afraid to have a single pregnant mother with three children and no income. After the divorce, the churches we visited over the next few years were either afraid of us or were too legalistic for a divorced mother. After several rejections, I stopped trying to find a church. (For more see IFB Flowchart and IFB Common Practices). We slept on mattresses on the floor, ate our meals off a cardboard box, skipped many meals, and collected soda bottles from ditches to buy medicine. We lived in a two-bedroom duplex (we did not qualify for welfare because I had boys and girls, and we needed at least three bedrooms.) The church never helped me. We usually had no electricity and often had no water because I didn’t make enough to pay our basic bills (we pretended we were camping with candles). We never had any furniture and could barely afford clothes and shoes from the Goodwill store. I used an ice chest to keep food cold, and filled up empty milk jugs with water from nearby church spigots in the middle of the night so we could flush the toilets. My rent was always late. My generous, sweet friend JoAnn let me move in with her and her mom. I joined the Orlando Police Academy. I was a scrawny 100 lbs, but I made it through the academy. Once I became a police officer, I had the opportunity to work off-duty jobs for extra income. I could only visit my children on the weekends. I worked 80–120 hours a week as a police officer, sometimes not sleeping for two or three days, but I was able to save enough money to rent a house with JoAnn and get my children back home before the end of the year, after being separated from them for five months. Once I got the children back in 1981, I still had to work at least eighty hours a week to pay for childcare for the four of them. I was exhausted for years, going from one job to another, and back and forth to different babysitters. We struggled for the next five years, but we did okay. I saved enough money to buy a small home in Pine Hills, Florida. We had a bit of normalcy—at least for a family of four children and a single mother with several jobs. I took every extra job I could find, but there was still never quite enough money to live on. It was a continual stress and struggle. One trip to the dentist or car repair shop put us behind again. In the sixth year of being single I was faced with foreclosure on our home. Childcare for four was more than my salary (why I worked three jobs) I could only get ahead with help. I called Louise Blue at the children’s home and she arranged for my children to stay again for a few months until I could get back on my feet. In 1985 my children returned to the children’s home for a few months. I’ll never forget the day I told them they would have to go back to the home for a while. The look in their eyes haunts me to this day. We started attending a mid-size, balanced Southern Baptist church in Florida. Our pastor led my husband in the prayer of salvation. I believe my husband was sincere, and he was baptized that week. A year later, because of my husband’s business, we moved to Tennessee. We placed the children in a private independent Baptist fundamental Christian school in 1986. Many of the other children were in the school because they had been kicked out of public school. Because the socialization was so negative and my six-year-old son was struggling to learn to read, we made the decision to homeschool. Eventually people from our church in Tennessee asked me to speak about raising children and homeschooling. Here is a photo after I spoke on Mother’s Day (with my girls and my sweet grandmother). Our Homeschool Story is here. 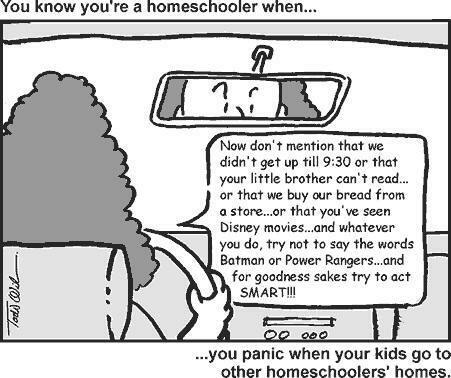 Homeschooling was very rare in 1987 but growing. I started traveling to give workshops in various churches in the surrounding areas to help people start homeschooling. I had three more children and worked hard toward my goal of becoming like the Proverbs 31 woman (a wife of noble character). I taught my children at home, sewed all their clothes, baked bread, and taught the girls to sew, smock, quilt, cook and clean. I was grateful for my children, a home, and food. We joined a balanced Assembly of God church. I have fond memories of the close fellowship we experienced for over five years. We made many friends there that I still have today. The only negative was our experience with a liberal youth group that planted seeds of rebellion in my teenage girls. I wanted to teach my children about running a business, so they started selling books in the back of the room when I spoke about homeschooling. Our little homeschool business grew rapidly. The children helped me send out newsletters and catalogs. My husband had a roadside real estate office, so I asked if we could sell books there. Our first store was about 500 square feet. The little store did well. I cut and pasted photos of my favorite books and made a catalog in Word and began mailing them out. Orders came in and we ran out of room so we turned our barn into a shipping department. After a few years my husband started helping with our homeschool business, and we moved from Knoxville to Nashville and rents a 2,000 square foot building, part of it was a retail store the back was the shipping department. It grew. All of the children worked at the store and we hired employees. (One of the best thing I ever did was have the children work in the stores as they all grew up to become business owners.) In the state of Tennessee you must register with the state or a Christian school in order to homeschool legally, so we began Family Christian Academy (a homeschool umbrella school). In five years the business grew to six homeschool stores in three states, a catalog business, and the school had six thousand students. I was determined to work hard and protect my children from the evil influences of the world. We were in a patriarchal community (patricentric movement) in its infancy, which has since grown to have a huge presence in homeschool conferences, online forums, and catalogs. Homeschooling in the patriarchal way brought in man-made rules and regulations (females always wearing dresses, men having “full quivers,” baking our own bread instead of buying ready-made, the right number of school hours, submissive daughters doing anything to please their fathers, etc.). I had new rules to follow too—and I thought that maybe this time I could get it right, and I was willing to work hard to do it. At this point I thought our marriage had normal ups and downs but I felt I never could please my husband. I read all the books I could find on marriage and parenting in hopes of fixing all the problems that resulted from our involvement in the patriarchy movement. Ninety-five percent of their goals are good, but there is also a very extreme and dangerous emphasis on submission, and a “work harder” mentality that is a breeding ground for legalism and abuse. I truly believed I was on the right path, but the “fruit” I produced proved otherwise. I lost my temper a lot, among other things, and when my children hit their teenage years they rebelled. In trying to fix our family, I ignored the cultic influence of the church because I couldn’t change it, and just kept trying harder. I studied my Bible at home and had Bible study with the children but I also passed down to my children unhealthy habits of performing to earn love and acceptance. Instead of teaching the love of God, I taught them (more by my actions, not my words) how to run on the performance treadmill and jump through behavioral hoops taught by patriarchal man-made rules instead of God’s Word. I was extremely critical of myself and others. While I was running on the treadmill I had a judgmental attitude toward anyone who wasn’t on the same treadmill I was on. I worked on the outside instead of the inside, and externally we appeared to be a godly family, but internally each of us was unraveling. We began to live like two separate families. My husband took my older children to work with him at eight in the morning and didn’t return home until after eleven each night, working them for fifteen hours a day. They spent the day either in the bookstore or in the shipping department, while I stayed home with the youngest children, homeschooling and writing. My husband and I argued daily. I was so frustrated; our entire lives were so focused on making money that we no longer had a family, just a work crew. I was very distraught that my husband treated my oldest daughter more like a wife than a daughter. They went out to restaurants almost nightly while I stayed home. He often took her on trips and bought her jewelry. He never bought me birthday gifts but often bought her gifts like a diamond bracelet for her birthday. I called our pastor for counseling. Counseling was really strange. My oldest daughter (in her twenties), my husband and I went together because the pastor was also concerned about my husband’s relationship with her. My husband cunningly turned every accusation of his inappropriate relationship with my daughter into an accusation about my anger. It was not productive. Eventually even the pastor suggested that my husband choose me or my daughter. My husband told me to pack my bags. The marriage ended in a messy divorce in 1998. I can never fully describe the impact the divorce had on our family. Divorce causes deep emotional pain and everyone involved wants to blame someone. Any military man will tell you that the way to pull a divided group together is to give them a common enemy. Thats’s what my ex-husband did. He insidiously turned each of my children against me by making me out to be the enemy—and I gave him the ammunition. This is known as Parent Alienation Syndrome. It is an insidious form of child abuse resulting in decades of pain. Almost twenty years after my first four children had been in a children’s home, my ex-husband used that event in our divorce papers to try to get custody of our three young children. It didn’t work, but it tore me apart—he knew my hot button and used it. He never spent more than ten minutes a day with our youngest children, yet when we divorced he fought for custody—and I was shocked. We settled on joint custody. My ex-husband convinced my oldest daughter—his step-daughter—that it was her biblical duty to live with him and care for the youngest children when they had them three and a half days a week. He used her for the next fifteen years to cook, clean, care for his children, and run the homeschool business. She never dated until she was 39 years old. My ex brainwashed every one of my children. I was falsy accused for over ten years and didn’t even know the lies were being told. By the time I found out it was almost impossible for them to accept truth. To this day, one of them deals with false memories (even when we show them photos and documents to show they are false.) Years of toting children back and forth between families, re-opening wounds with every trip, was horrible. I was angry and bitter and fought weekly with my ex. I poured myself into work—I schooled the children and then wrote curriculum for sometimes up to ten hours a day. I repeatedly forgave my ex-husband and prayed regularly for him for many years. He had also grown up in a very dysfunctional family, and hurt people hurt people. What gives me, a divorcee, the right to write about God? My past includes rebellious teenage years, failed marriages, and judgmental legalism. I am a sinner. I have asked for forgiveness from God and my family. God has mercifully forgiven me, and some of my family has forgiven me, for which I am grateful. Should Christians who have been forgiven have to endure the results of their sin? Yes, sometimes. Forgiveness and consequences are not opposite ends of a spectrum. Together they establish an essential part of the Lord’s plan for believers. Consequences are circumstantial. My wrecked relationship with several of my children—the most painful thing I have ever experienced—is a direct consequence of my sinful choices. I’ve repented and apologized repeatedly for those many years that I was wrapped up in spiritual self-reliance and cheated them of the joy of life in union with Christ. Most of my children have forgiven me. Most of us have a good relationship but we are still in a healing process. One of my consequences is watching my adult children struggle with the aftermath of our broken family. If you have known the pain of a divorce, you have felt a small portion of the pain you feel when you are rejected by a child. If I wrote a book about our lives I would title it “Separate Realities” because we all have such drastically different views of what happened. My children know I love them. But it took years of un-brainwashing. To the right is a photo from a family get-together that my husband and daughters planned as a surprise for me in 2011. I continue dealing with the consequences of my life of sin. It’s a journey; we have come far, and we have far to go. It’s easy to lose focus and rely on working overtime to please God through our good works and righteous behavior, but we can never do it in our own strength. At the very root of all Christian life lies the thought that God is to do all—that our work is to give and leave ourselves in His hands, in the confession of utter helplessness and dependence, in the assured confidence that He gives all we need. “The great lack of the Christian life is that, even where we trust Christ, we leave God out of the count. Christ came to bring us to God. Christ lived the life of a man exactly as we have to live it. Christ the Vine points to God the Husbandman. As He trusted God, let us trust God, that everything we ought to be and have, as those who belong to the Vine, will be given us from above.” —Andrew Murray, The Secret of God’s Love Due to the divorce and the many lies my children were told, I was on very shaky ground with several of them for years; but after my ex-husband died in 2013 (no longer here to twist the truth) they have all reconciled with me. I will always regret missing precious years of some of my grandchildren’s childhood. My second daughter, Rebecca (Well Planned Gal) is mother of five (Jenny, Abby, AnnMarie, John, and JoeJoe) and CEO of HEDUA she designed (Well Planned Day Planners for homeschoolers and publisher of Family Home Education Magazine). UPDATE 2017: I will not allow my children to associate with Rebecca any longer. She turned into a pathological liar recently divorced and remarried. The result of my problems above and the her attending a cult for 10 years resulted in extreme bitterness. She spreads vicious, hateful, damaging lies about me and our family. I pray for her but the damage is deep. She will need years of counseling to heal. Meanwhile she travels to homeschool conventions telling other mothers how to raise their children while her oldest daughter refuses to talk to her. So sad–but it happens more often than you think. Michael is a security guard at Opryland.